For further increasing the number of sales in car market, MSIL has launched the facelifted version of its popular hatchback K10 with minor updates. It is being sold with both manual and automatic transmission gear box. Among several variants, Maruti Alto K10 VXI is the top end trim in its model line up. The exterior changes includes a redesigned radiator grille with a single chrome slat, revamped bumper and a new headlight cluster. At the same time, the internal cabin gets a dual tone dashboard, which is equipped with a new steering wheel and redesigned AC vents. The company has not made any changes to its technical specification. It comes with the same 1.0-litre petrol engine under the bonnet, which has a displacement capacity of 998cc. It is coupled with a five speed manual transmission gear box, which allows it to deliver 67.04bhp of power along with a torque output of 90Nm. The braking and suspension mechanism of this hatchback are quite proficient, which keeps it well balanced at all times. At present, it is being sold in several color options, which are Silky Silver, Fire Brick Red, Superior White along with the new Granite Grey, Tango Orange and Cerulean Blue finish. 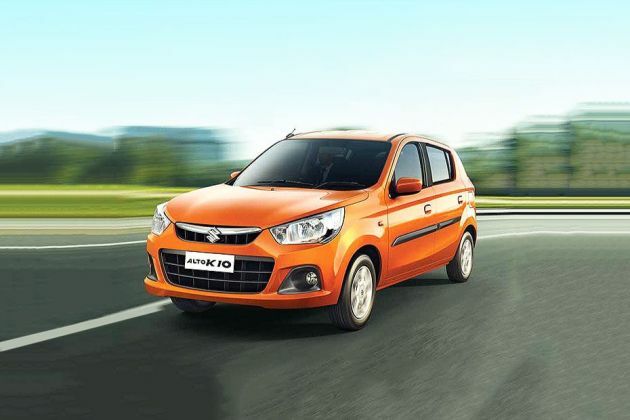 This small car has a budget friendly price range and competes against the likes of Chevrolet Spark, Hyundai Santro Xing, Datsun Go and Hyundai Eon. It is being offered with a standard warranty of two years or 40000 Kilometers, whichever comes first. While the buyers can also avail an extended warranty of one year or 60000 Kilometers at a nominal cost. The outsides of this compact hatchback are done up with utmost care and fitted with a number of striking features includes a bold front grille and a slanting bonnet, which brings an aerodynamic look to its front. To begin with the side profile, it has black colored door handles and outside rear view mirrors, which are internally adjustable. Its neatly carved wheel arches are fitted with a sturdy set of 13-inch steel wheels, which are covered with 155/65 R13 sized tubeless radial tyres. These rims are also protected with full wheel covers. It has a bold radiator grille, which is fitted with a single chrome slat. It is embossed with a prominent company logo in the center. It is surrounded by a well designed headlight cluster that is incorporated with high intensity headlamps and turn indicators. The body colored bumper houses an air intake section for cooling the engine. Its windscreen is integrated with a set of wipers. Its rear end has a body colored bumper and a new tail light cluster. The windshield is integrated with a centrally located high mounted stop lamp. It has a curvy boot lid that is embedded with variant badging. The overall dimensions are quite standard and it is designed with an overall length of 3545mm along with a total height of 1475mm. It has a total width is 1515mm along with body side moldings. The large wheelbase is 2360mm and it has a minimum ground clearance of 160mm. The manufacturer has equipped the internal cabin of this Maruti Alto K10 VXI with quite a number of aspects, which will certainly impress the customers. To begin with the seating arrangement, it is very comfortable and provides ample leg space. These seats are covered with premium fabric upholstery. Its rear seat is foldable, which further helps in increasing the boot volume. The two tone dashboard is equipped with a number of features, which are AC vents, a glove box, an instrument panel and a 3-spoke steering wheel. The instrument cluster is installed with a number of functions and displays notifications like shift up indicator, driver's seat belt warning lamp and a few others. Then this small hatchback also has front cabin light, two cup holders in floor console, piano black finished instrument panel and a rear parcel shelf. This particular trim is powered by a 1.0-litre K-series petrol engine, which comes with a displacement capacity of 998cc. It has the ability to churn out a maximum power of 67.04bhp at 6000rpm in combination with a peak torque output of 90Nm at 3500rpm. It is cleverly mated with a five speed manual transmission gear box, which sends the engine power to its front wheels. It is incorporated with a multi point fuel injection supply system, which allows the hatchback to deliver 24.07 Kmpl on the highways and 20 Kmpl in the city traffic conditions. On the other hand, this motor has the ability to achieve a top speed in the range of 135 to 145 Kmph. At the same time, it can accelerate from 0 to 60 Kmph in close to 5.3 seconds from a scratch. The braking mechanism of this Maruti Alto K10 VXI trim is quite efficient. Its front and rear wheels are further fitted with a set of ventilated disc and drum brakes respectively. On the other hand, its front axle is assembled with a gas filled McPherson strut, while the rear axle gets a three link rigid axle suspension. This variant has a power assisted steering wheel, which has the turning radius of 4.6 meters. It is bestowed with an efficient air conditioning unit that keeps the entire cabin cool. The manufacturer has given it a music system, which supports CD/MP3 player, USB interface along with two speakers. Apart from these, it also has front power window, tailgate opener, front cabin lamp, key off audible reminder, internally adjustable outside mirrors, dial type climate control and digital clock. There are front sun visors available with passenger side vanity mirror. It also has a 12V power socket in center console for charging mobiles and other gadgets. The list of features include a pair of fog lamps, key-off reminder notification, rear doors with child safety lock, three point ELR seat belts for all passengers, ventilated front disc brakes, high mount stop lamp, headlamp on warning with buzzer, driver's seat belt indicator and a central door locking system. 1. Initial cost of ownership is quite affordable. 2. Striking exterior appearance with modified features. 1. Engine performance can be improved. 2. More safety features can be added.